Ethan's initial bemusement with his new sister seems to be growing into genuine affection and intrest. Last week at his Toddler's Sunday School class when the teacher was explaining the story of how Baby Jesus was born on Christmas Day, Ethan inexplicably took a deep interest in the 'baby' and couldn't let go of it for the rest of the class despite gentle cajoling from teachers, our helper, Mary & myself! It was actually quite sweet to see how gentle he was in carrying the baby and even knew how to hold it in the right position! 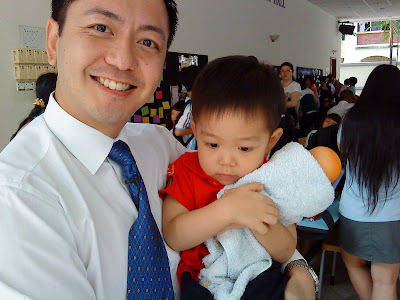 Here he is with Daddy long after Sunday School was over, still 'clinging to Jesus'!